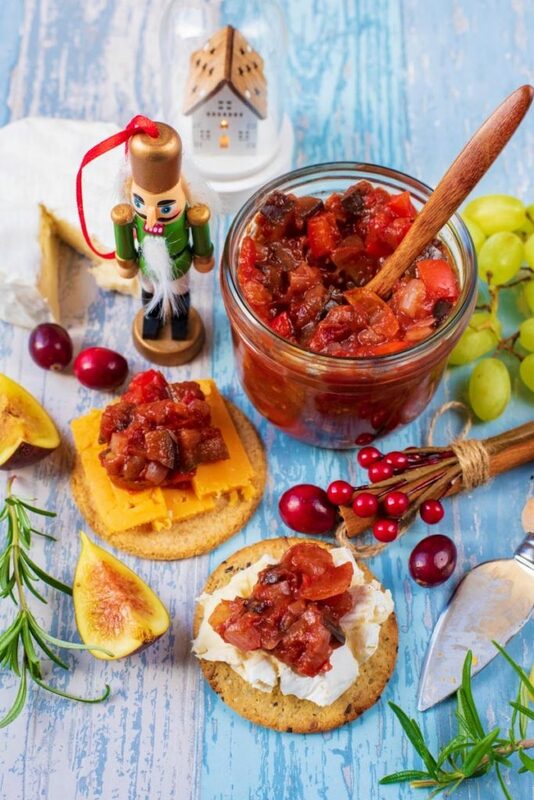 We have combined some of our favourite festive flavours in to this lower sugar Christmas Chutney, along with some hidden vegetables so you can feel a little bit better about eating it alongside that cheeseboard this Christmas. 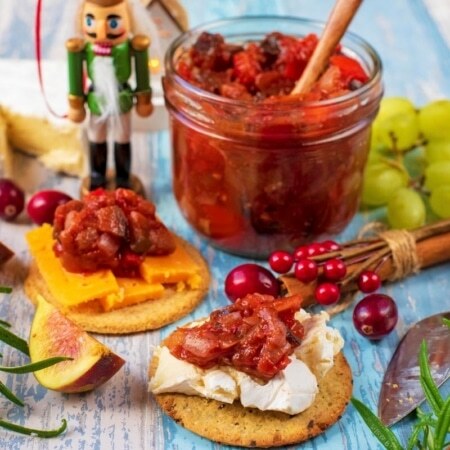 Ginger, cinnamon and a hint of chilli add tonnes of flavour to this tomato based chutney, to give it a festive twist. Some kind of chutney is a must at this time of year. Once that jar gets opened, you can have it on a leftovers sandwich, stirred in to Greek yoghurt to make a dip, use it as a salad dressing, put it in a burger, or have it with your cheeseboard. The options are almost endless. 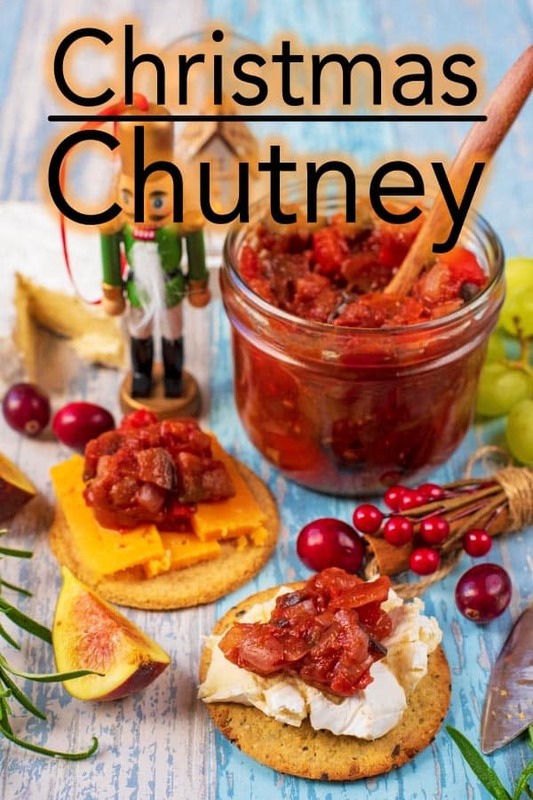 There are so many different chutneys out there, but this festive Christmas chutney is a firm favourite in our house. We have used cinnamon, nutmeg and ginger to give it a festive flavour, but also added a little bit of chilli so there is a kick of spice in there too. What else makes this festive? This isn’t just a tomato based chutney, as we have used cranberries to bulk it out, add a vitamin boost and some more colour. Delicious chutney usually falls in to three categories – onion based, fruit based or tomato based. We went with a tomato based chutney so the bulk of it was fairly mild, and the Christmas flavours could shine through. But you could vary it depending on your tastes. 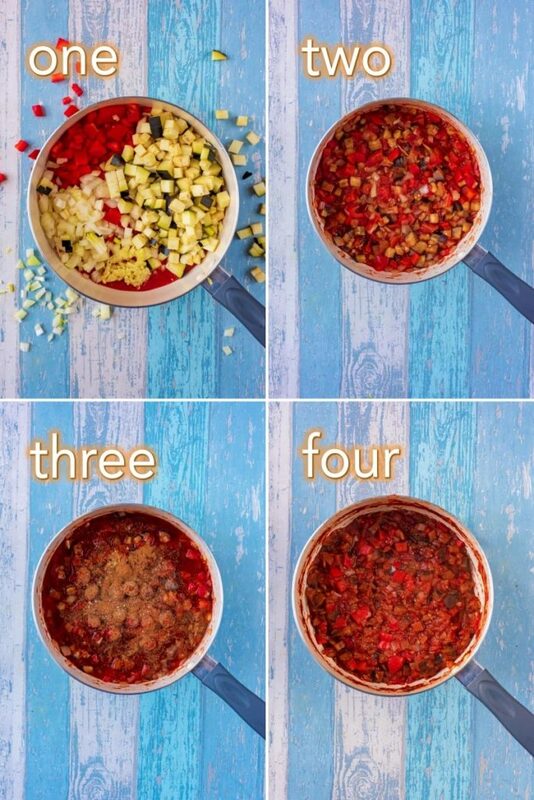 We kept things simple and just used a tin of chopped tomatoes (the best quality you can find will give the best flavour), but you could chop up fresh tomatoes and use those instead with a little extra liquid. 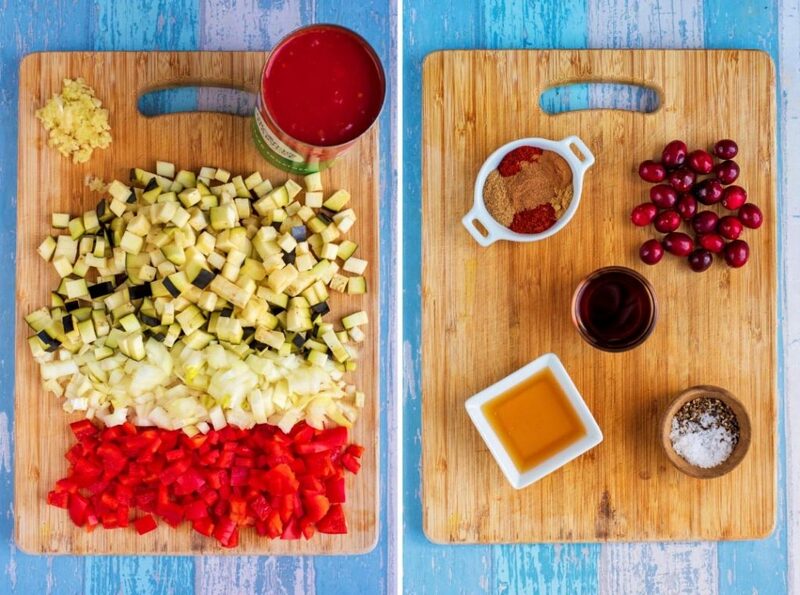 Not only is there lots of festive flavour in this chutney, but some added vegetables too. Red pepper and aubergine make this chutney recipe nice and chunky, with some extra vitamins too. A cheese board is a must at Christmas time and deciding what cheese to have on that board is one of the hardest decisions you will have to make during the festive season, if not the hardest decision of the entire year! Yes, we take cheese that seriously! A mature cheddar is a must, it’s a classic. I would say that goats cheese has to be on there too, whereas for Dave it wouldn’t be complete without some Stilton. 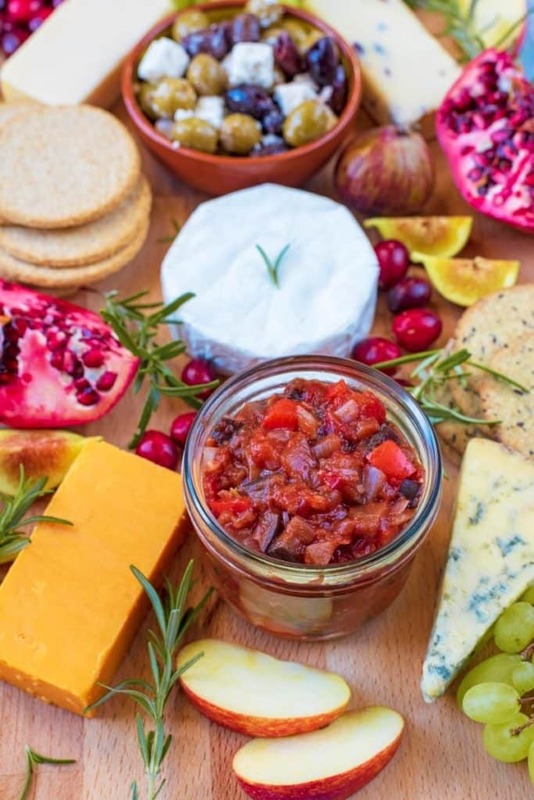 Whilst we may not totally agree on the essential cheeses to go on the board, which is probably why we end up with about 10 different cheeses on there, we do agree that chutney is a must. Another tip when it comes to a cheese board is add lots of fruit too. Not only does it balance out the heaviness of all the cheese, but the sweet and creamy really compliments each other and fruit will add a lot of colour to the cheese board too. We went with grapes, figs, apple and pomegranate. This chutney will last in the fridge for about 5 days, but it honestly doesn’t last that long with us at Christmas, and that is with just 2 of us eating it. If you are having guests over, you might want to make a bigger batch to share it around. If you are going the homemade Christmas present route this year, then these would make lovely gifts. Put them in a nice jar and put a bow round it and ta-da! Give it with a cheese board bursting with cheese too and you would be my best friend for life! One: Put the tomatoes, red pepper, aubergine, onion and garlic in a pan and smash the tomatoes with a back of a spoon. Bring to the boil and simmer for 20 minutes. Add a little bit of water every 10 minutes if it gets too dry. Two: Add the rest of the ingredients to the pan, stir well and bring to the boil again and simmer for a further 10 minutes. Three: Leave to cool and pour in to a jar to store. The cayenne pepper is added for taste, so adjust it depending on how spicy you like things. This chutney will keep in the fridge for 5 days. But leftovers are great in sandwiches and burgers. You can swap the tinned tomatoes for fresh tomatoes, just add a bit more liquid. 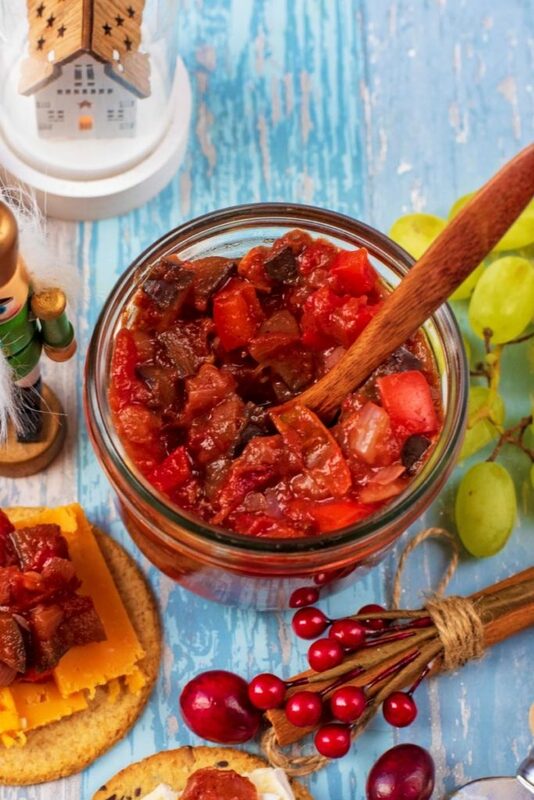 Do you want to be kept up to date on more delicious posts like this Christmas Chutney? Please subscribe to the blog mailing list (it takes 30 seconds). 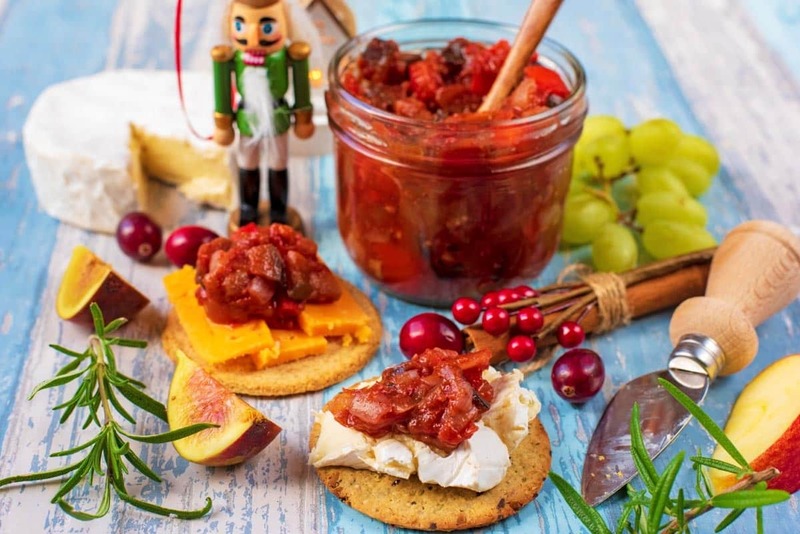 If you’ve tried this Christmas Chutney, or any other recipe on the blog, then let us know how you got on in the comments below, we love hearing from you! You can also FOLLOW US on FACEBOOK, TWITTER, INSTAGRAM and PINTEREST to see more delicious recipe ideas, behind the scenes shots and also what we are getting up to. Put the tomatoes, red pepper, aubergine, onion and garlic in a pan and smash the tomatoes with a back of a spoon. Bring to the boil and simmer for 45 minutes. Add a little bit of water every 10 minutes if it gets too dry. Add the rest of the ingredients to the pan, stir well and bring to the boil again and simmer for a further 20 minutes. Leave to cool and pour in to a jar to store. What a delicious sounding chutney, my husband loves his chutneys so I’ll share this with him. How spicy is the chutney? I’m loving this fantastic flavor combo- the colors are all really festive too! This would be a perfect holiday appetizer! I think I just found the perfect addition to my cheese platter for the Holidays. Thank you! Chutneys are so perfect for this time of the year and a cheese platter is my favorite. I need to try this recipe. recipe. Eggplant and cranberry… cool combo.